"...a rather identifiable Italian aesthetic...can be credited to the custom designs of early couturiers like Emilio Schuberth...His clothing embodied the concept of la bella figura, [which]...communicated Italy's inherent sensuality, grace, and love of leisure, all qualities that would later signify Italian style in global consumption." Still, I'd never heard of Schuberth before. It's always strange to me when some artists, or designers, or musicians fade into the annals of history despite a significant contribution to their respective art forms as we've come to know them. In the fashion world, Charles James might be another notable example, although the 2014 exhibition of his work at The Met certainly advanced the case that he was one of the great minds and talents in the history of fashion. In any event, it's never too late to celebrate someone's achievements, so let's do so by taking a look at a few of Schuberth's creations. 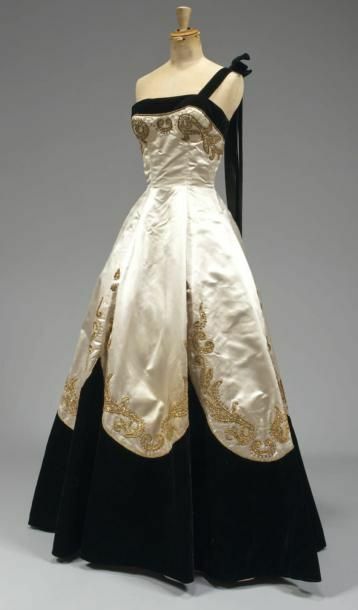 Silk chiffon evening dress circa 1955/1956. Collection Galleria del Costume di Palazzo Pitti, Florence. Photo: Gabinetto fotografico SBAS, Mauro Carrier. 1950's silk chiffon evening gown via Chez Sarah. Fitting Sophia Loren for a gown in 1951. Feature image is a gown from 1951.